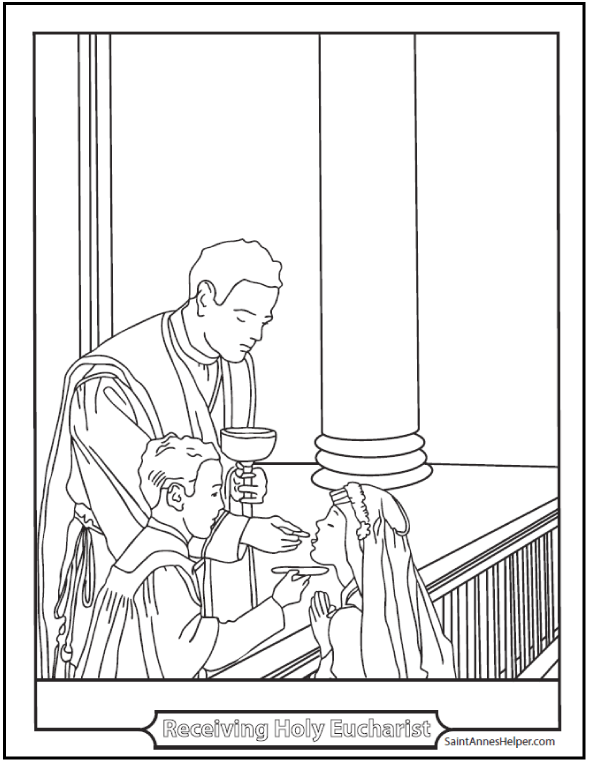 Teach receiving Holy Eucharist with this coloring page. It's great for sacrament preparation, catechism class, and even altar boy training. See Rule #1 and some prayers below the picture too. This PDF prints 8.5x11" single sided. This lovely picture is from an old Baltimore Catechism that shows a girl receiving the Holy Eucharist kneeling at the Communion rail. Rule #1: Keep First Communion day low stress and say frequent short prayers. It seems redundant to think we have to teach the children to say their prayers when they are receiving Holy Eucharist, yet we do need to help the children focus on Jesus without building stress. Children are so often tempted to look around or to wonder where their families are. This is also another reason that many parishes restrict photos at this time. Photos are very distracting to the children. Even the family party that afternoon can be a distraction or add stress. It is a super good idea to encourage the habit of saying the Act of Contrition on the way up to the altar and to say a Hail Mary when receiving Communion. 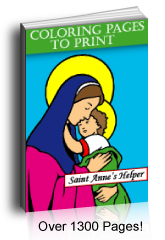 Saint Anne's Helper First Communion catechism has before and after Communion prayers from the Baltimore Catechism at numbers 77 and 78. Here's all of the First Communion questions and prayers here with a few samples below. Did I mention Rule #1? Mary my Mother, help me to prepare my soul for the coming of Jesus. Jesus, I believe that thou art truly present in the Host, and very soon, Thou shalt be truly present in my heart. I am sorry for all my sins because I love thee and have saddened Thee. I will try not to sin again. I love thee, Jesus; I love Thee with all my heart! I love Thee above all things, and I would like to love Thee more! Come, my Jesus, come to me! My heart is longing for Thee! Mary, my Mother, welcome Jesus into my heart! Once the children see how short these prayers are, they're likely to think of their own. It's wonderful when they pray directly to Jesus and Mary with their own requests. And should not be any more complicated than a Hail Mary as this is not a time to be distracted nor is there usually much time for more. Again the idea is not to distract the children. Thank you, Jesus, for coming to me! I believe that Thou art truly present within me now. I bow down before Thee and I adore Thee. I love Thee, Jesus, with all my heart, with all my soul, and with all my mind. I will try to love Thee always more and more! Mary, my Mother, pray to Jesus for me. Jesus, grant to the souls in Purgatory eternal rest. Amen. Added to the children praying praying at Mass, on First Communion day we like to ask the children for their prayers because they are so likely to be answered well. Parents can simply ask them to remember to ask God to help everyone who asked as well as family and friends. This covers those for whom we have a duty to pray and assures the children that they prayed for what they should.